Licensed and published in Japan by Intergrow Inc. 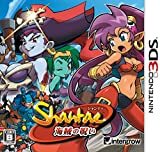 Copyright （C） 2015, WayForward Technologies, Inc. Shantae and the Shantae Logo TM Matt Bozon. All rights reserved.